Griffith Moon Publishing, 9780999845288, 94pp. In 2013, Donald Trump got involved in his first sustained Twitter War. Unfortunately for Trump, in this endeavor as in so very many others, he was not up to the task. If you're someone with no discernible sense of humor - someone for whom ridicule is like Kryptonite - a professional comedy writer would not be an ideal opponent with whom to engage. 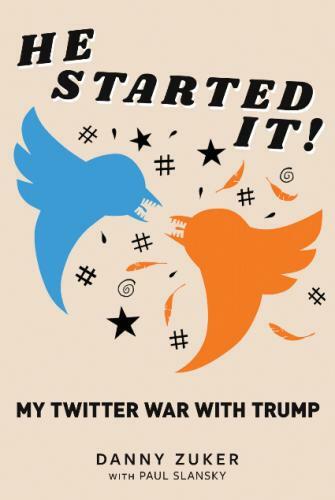 He Started It : My Twitter War with Trump is the complete record (with commentary) of Donald Trump's hilarious three-month-long delusion that he was outwitting Danny Zuker (Modern Family, Just Shoot Me, Roseanne). Introduction by Paul Slansky. A PERCENTAGE OF EACH SALE GOES TO PLANNED PARENTHOOD, RAICES (the Refugee and Immigrant Center for Education and Legal Services) and the WORLD WILDLIFE FUND. When not trolling the leader of the free world, Danny Zuker (@DannyZuker) works as a television comedy writer/producer. He’s spent the last nine years as one of the executive producers of Modern Family, and has worked on many shows including Evening Shade, Roseanne, Just Shoot Me, and so many flops. Paul Slansky (@slansky) is the author of The Clothes Have No Emperor: A Chronicle of the American ‘80s and five other books that savagely mock the idiots, hypocrites and demagogues who masquerade as our “leaders.” In the summer of 2016, he created (and continues to curate) www.trumpelthinskin.com, a website dedicated to disrespecting Donald Trump.